Howdy folks! We here at The m9 are proud to present the first gig of our Third Season this coming Friday night, September 25th at the Royal Room at 8pm. The m9 joins legendary Romanian Rom fiddler Lache Cercel and Roma Swing, as well as Seattle’s The Entertainers for an evening of thrilling Romani-style tunes from across Europe. We’re extremely lucky to appear on this bill, and we hope you’ll come to hear both of these amazing acts, whether or not you stay for The m9 at 10pm. Lache’s own brand of Romanian swing is at once exciting and eclectic, a hang-on-with-both-hands ride through lightning melodies and dances which will have you on your feet and possibly overturning tables. 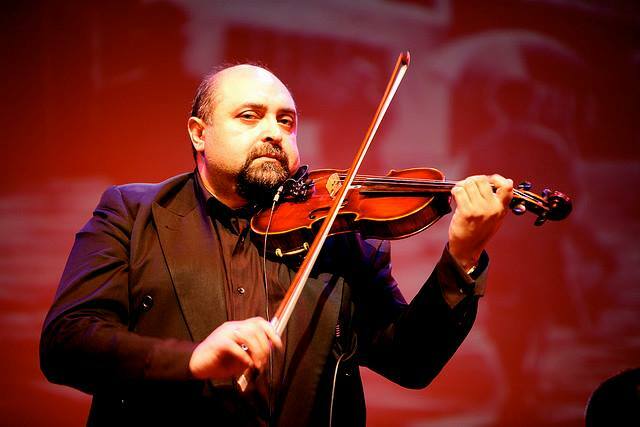 His virtuosic fiddling is amply supported by the considerable talents of The Roma Swing Ensemble, who provide the unending racetrack for Cercel’s galloping violin. Brothers Teddy and Vinny of The Entertainers bring their own enormous talent to a host of hits ranging from Django-style jazz to cinema classics. Their delicate, yet wicked guitar work echoes through their generous, and sincere performance. You’ll laugh, cry, and beg for more. Please join us and bring your friends in need of merriment. The show is free, but donations are heavily encouraged to support all of these very hard-working musicians. Please do come, and give what you can!